The Blue Jays are not where they want to be in the standings. That much has to be acknowledged. While it’s long been understood that the American League East was again going to be a challenging division, the Jays have still been a disappointment, and it’s an open question whether the front office might elect to start selling in advance of this month’s trade deadline. The train has gone off the rails, and while the rails are just right there, within reach, it’s no simple matter for any train to reattach. You know how trains are. And as long as we’re saying things up front, this is an article about Jays closer Roberto Osuna, and not even very long ago Osuna was in the news because he had to miss a few games, owing to rather severe anxiety. Anxiety is a sinister thing, and a personal thing, and it’s not a villain you conquer with a good night’s sleep. Possibly, it will march alongside Osuna for the rest of his life. Probably, it will linger for at least another few years. It’s just one of the things he’ll have to deal with, like someone else might deal with a wonky knee. So it hasn’t been all rainbows for Osuna, nor has it been puppy dogs for the baseball team around him. 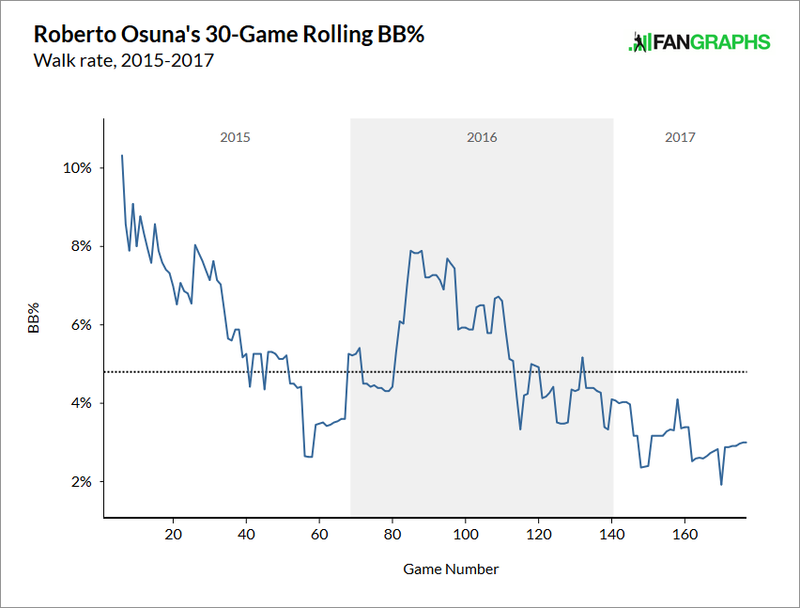 But this much can be said: When Osuna has taken the mound in 2017, he’s been absolutely sensational. Osuna was already a perfectly fine closer. What he is now is something else, something very nearly perfect, at least by human standards. Osuna’s only 22, and he’s pitching at the top of his magnificent game. Osuna doesn’t walk many guys. This is one of the benefits of throwing more than 70% of your pitches for strikes. This season alone, Osuna has faced 129 batters. He’s issued a walk to just three of them. 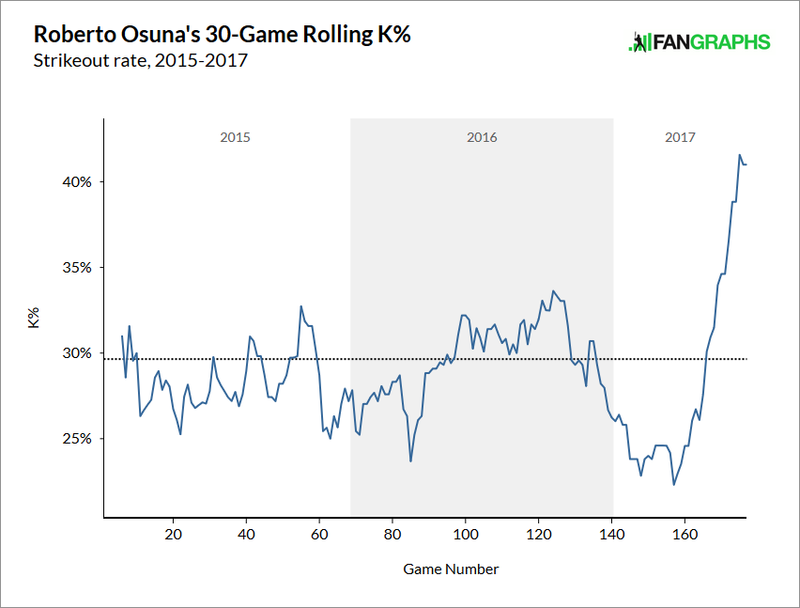 There’s no faking that kind of control, but, as you might’ve guessed, this isn’t the only area where Osuna is thriving. Time for the strikeouts! Osuna has never before struck out batters like this. Lately he’s pushed a rate of 40%, and, yes, there is an explanation, which we will get to. But I’m not quite done with these plots. Where do strikeouts come from? A few places, I guess, but it never hurts to get batters going out of the zone more and more often. 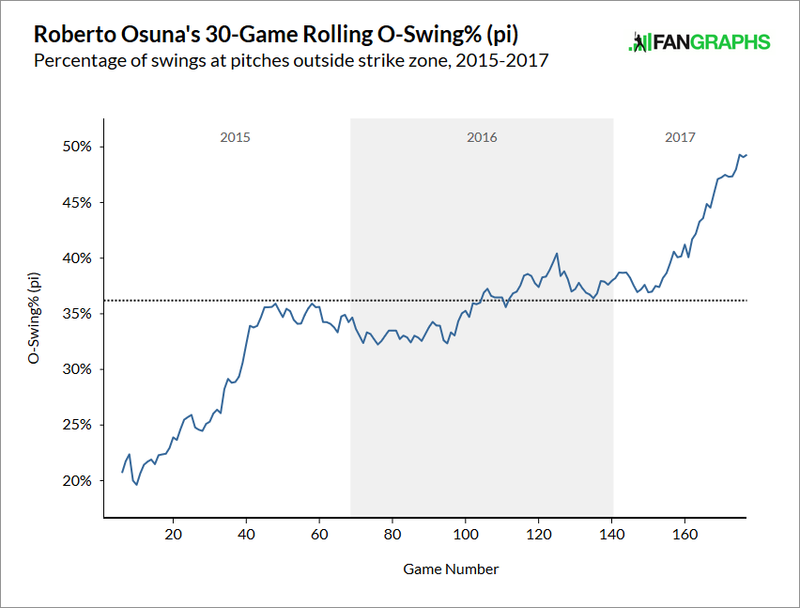 Osuna, as a rookie, generated an O-Swing% of about 30%. Now he’s at 46%. It’s getting to be silly. Now, then. What’s the actual story here? 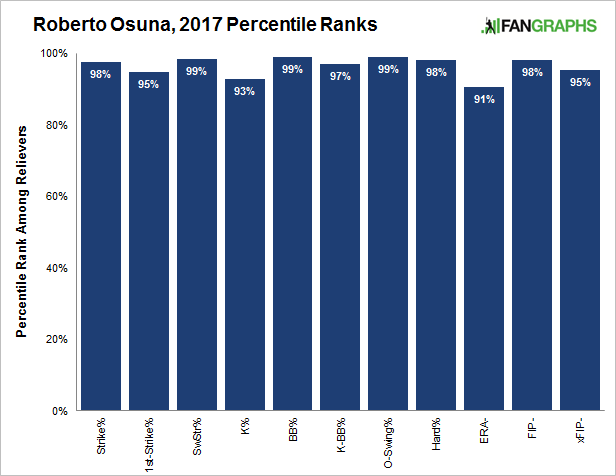 It’s easy enough to see that Osuna has been one of the very best pitchers in baseball. But what is it that unlocked this level for him in the first place? You could argue that the answer is command, because his command is exceptional, but there’s been a bigger and more recent change. Here’s one more rolling-average plot, this time with the time span shrunk to 15 games, instead of 30. This shows Osuna’s pitch usages. Specifically, this includes his four-seam fastball, his slider, and his cutter. The “pi” refers to Pitch Info, which is the data source that fuels Brooks Baseball. Osuna now is more about attacking glove-side, against righties and lefties alike. The four-seamer is still there, commonly up in the zone, but the cutter and slider hang around or just off the glove-side edge. 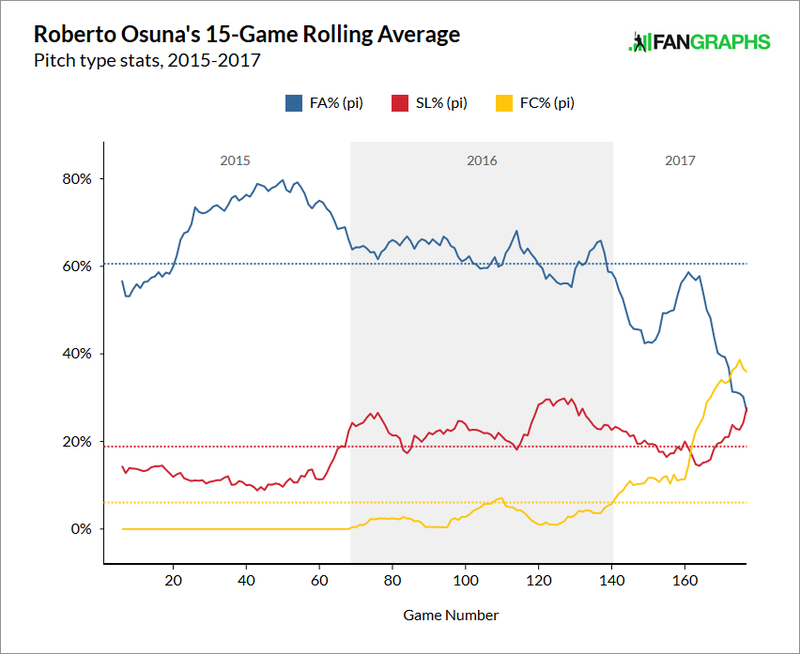 This table is going to be a little nerdy, but I think it helps to gain a fuller understanding of what Osuna does. Here, you see Osuna’s pitches, along with their average velocities, horizontal movements, and vertical movements. Focus, if you will, on the cutter and slider. There’s no shortage of relievers who succeed on a fastball and slider alone. Osuna has that additional twist, with a cutter kind of in-between the four-seamer and the slider. The cutter and slider would look similar out of the hand, but the cutter has an additional three or four ticks. The slider drops by an additional three or four inches. It’s no coincidence that, on average, the cutter and slider have been thrown to similar horizontal locations, but with the slider ending up more low. It’s all about pitch-masking. Osuna now throws all his pitches with confidence, and hitters often can’t tell whether they’re getting a cutter or a slider until it’s too late. Although Osuna didn’t get the call, he did get the reaction he wanted. The hitter was frozen, because a similar-looking pitch was slower, with additional drop. There’s not a dramatic degree of separation between the cutter and the slider, but there’s enough to get a whiff or partial contact. 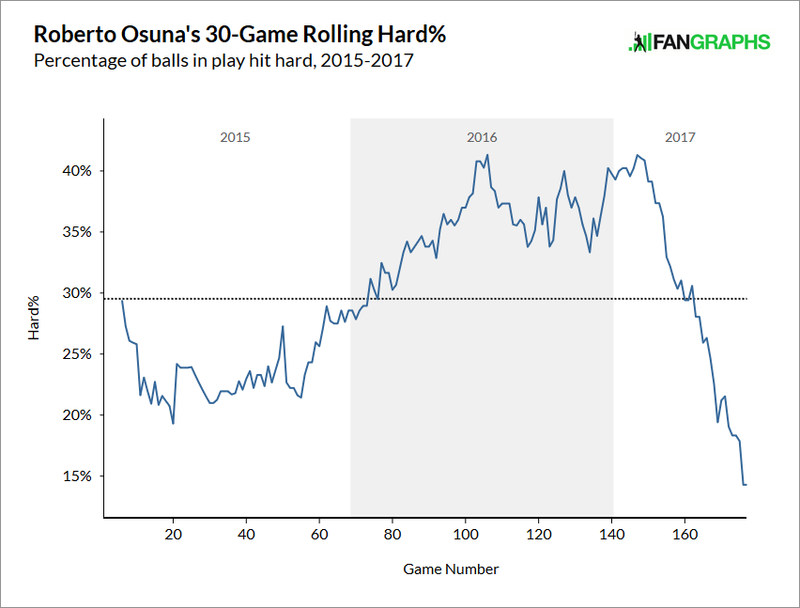 This season, Osuna has generated more whiffs and partial contact. Even though this isn’t great analysis, the only reliever with a better average percentile ranking, out of all those categories, is Kenley Jansen. Then it’s Osuna in second, followed by Andrew Miller, Craig Kimbrel, and Sean Doolittle. Perhaps you didn’t realize that Doolittle is back. He’s great! Good for Doolittle, and good for the A’s. But the focus here is on Osuna, and he’s pitched like a legitimate star, to whatever extent you can have a star closer. Osuna takes control of nearly every at-bat, and he’s loathe to ever cede it. Some pitchers have trouble keeping a cutter and slider separate. Over time, they can blend into one pitch, and that’s not what anyone wants. That could be a challenge for Osuna down the road, because other pitchers have attempted this before, with spotty results. But Osuna right now seems to be in charge of his repertoire. He’s keeping all of his pitches separate, with success, and hitters don’t know what they’re supposed to do. Roberto Osuna has been pitching like a perfect closer. That’s something to help everyone feel better about a disappointing season. We hoped you liked reading Roberto Osuna Is Just About Perfect by Jeff Sullivan! This is a fun article but my point is I laughed sitting alone looking at my phone like a strange person because of the “trains” bit. And that Jeff would probably be the best Fangraphs writer to have a cartoonist follow him around and illustrate his articles.